with upcoming government budgets and a new Minister of Agriculture in Ontario, February will be a big month for farmers. We are involved in the pre budget consultations for both the federal and provincial governments, and we are actively pursuing the permanent implementation of the Risk Management Program (RMP) by the Ontario government with the long term goal of bringing the federal government on board as a partner. Our primary mission in the cold days of February will be to stress the importance of implementing a permanent RMP to the new Minister, Carol Mitchell. We are also looking to Minister Mitchell to bring our concerns to the federal Minister of Agriculture, Gerry Ritz, at the federal-provincial-territorial meetings which take place in Toronto on February 5. Grains and oilseeds producers have made a significant monetary commitment to RMP through premium payments. We know that Ontario is facing budget challenges and that all expenditures will be examined in the coming weeks as the budget is drafted. For Ontario, RMP represents good value as the province has paid out only 9% of the budgeted amount while providing our sector with needed income stability. The Ontario government paid approximately $17 million into RMP – far less than what would be paid out in ad-hoc emergency aid if there was no RMP – while we have paid in over $48 million. In 2008/2009 grains and oilseeds prices were high and producers had a good idea that any RMP payments would be minimal – yet we still paid into the program. We have made a commitment with our pocketbooks and we are optimistic that the province will too. 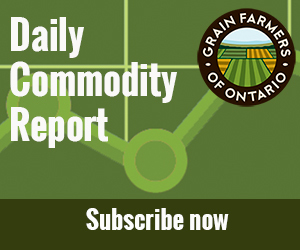 Grains and oilseeds producers have also joined forces with other commodity groups across Ontario in a formal coalition (the Ontario Agricultural Sustainability Coalition) to seek business risk management programming for all commodities modeled on our RMP. Meetings with MPPs and MPs will be organized by the OFA over the coming weeks and we urge all GFO members to attend and make the case for a permanent RMP for grains and oilseeds in early 2010. Without RMP for grains and oilseeds there is very little chance that RMP will be extended to all commodity groups.